- Bob Dylan On Canvas, Halcyon Gallery, London, 2010 (Drawn Blank Series paintings) – no printed catalogue? - Face Value and The New Orleans Series, Museum of National History at Frederiksborg Castle, Denmark, 17.04.–03.08.2014 – catalogue(s)? - Revisionist Art, Castle Fine Art, Cheltenham, 12.04.–12.05.2014 (same as Halcyon Gallery) – no printed catalogue? This appeared with two different covers, Woman In Red Lion Pub for the museum version and Man On A Bridge for the trade version. Each appeared in a German and an English version. The later catalogue by Halcyon Gallery (Train Tracks cover) is entirely different in that it contains many previously unpublished versions of the paintings. This appeared in Danish, English and German versions. Appeared with four different covers, but each with the same content. A hardback catalogue for this exists and was sold at the exhibition. 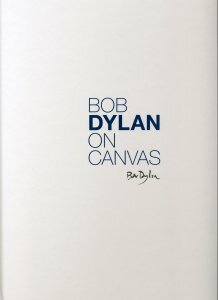 Do you know if there were different editions of this catalogue for the 2010 and 2013 Bob Dylan On Canvas exhibitions? 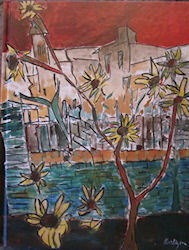 I just looked it up, the Bob Dylan On Canvas catalogue from 2010. Also there is a nice big new hardback catalogue of the 2013 DBS / On Canvas Halcyon show. Still such a shame that there isn't a catalogue for The New Orleans Series. There is also an Italian-published book "The Drawn Blank Series" (Allemandi 2010). A Beaten Path, venue tbc, London, October 2016 – catalogue? Portal (26' x 15' metal archway), on permanent display at MGM National Harbor, National Harbor, MD from December 2016 – catalogue? I doubt there'll be a catalogue for Portal, unless Bob gets real desperate about hawking his signature. You are right about "Portal". Maybe it will feature in the printed material undoubtedly soon to be made available for the opening of the casino, though. Catalogues/books I would still like to see released are "The New Orleans Series" and "The Gangster Doors". Although this list is comprehensive, it is far from complete. In addition to the hardbound and softcover books listed above, Washington Green and Halcyon Gallery have published catalogues in limited print runs over the years which contain new images. The Drawn Blank Series is a monumental undertaking which has run from 1994 to 2018. Just as Dylan has constantly reworked the lyrics to his songs in performance (and now with Mondo Scripto, in writing, too), he has revisited the Drawn Blank images, changing the colors in fresh, dramatic ways. A quick look at the 2018 10th anniversary Drawn Blank catalogue reveals that Dylan's painting technique has evolved in stunning fashion. The Drawn Blank Series, catalogue, 72 pages, published in 2008, Washington Green. The Drawn Blank Series 2009, catalogue, 36 pages, published in 2009, Washington Green. The Drawn Blank Series 2010, catalogue, 68 pages, published in 2010, Washington Green. The Drawn Blank Series 2011, catalogue, 36 pages, published in 2011, Washington Green. The Drawn Blank Series 2012, catalogue, 36 pages, published in 2012, Washington Green. The Drawn Blank Series: Train Tracks, catalogue, 28 pages, published in 2012, Washington Green. The Drawn Blank Series 2013, catalogue, 56 pages, published in 2013, Washington Green. Side Tracks, catalogue, 24 pages, published in 2013, Halcyon Editions. The Drawn Blank Series 2014, catalogue, 48 pages, published in 2014, Washington Green. The Drawn Blank Series 2016, catalogue, 36 pages, published in 2016, Washington Green. The Drawn Blank Series 10th Anniversary, catalogue, 56 pages, published in 2018, Washington Green. The Beaten Path 2017, catalogue, 64 pages, published in 2017, Washington Green. The Beaten Path: The Silkscreen Collection, 48 pages, published in 2017, Halcyon Gallery. I have simplified the list by only including the first exhibition/release of each group of works. Important repeat exhibitions like the ones in Denmark and New Orleans are still listed, though. There are several different versions of the Drawn Blank and Beaten Path catalogues.